Nature loves. It shows its heart if you look. In his song “Nature Boy,” Nat King Cole sings, “The greatest thing you have to learn is just to love, and be loved in return.” Nature is abundant with plants that help us learn to love and be loved in return—and not all of them are for the Viagra-kind of love. The quest for romantic love is a part of the human condition. Daniel Moerman, author of Native American Ethnobotany, recorded over a hundred stories of Native American tribes using plants as love charms to lure a potential suitor. For instance, the Iroquois considered asters, which are daisy-like flowers, to be love medicine. Perhaps asters were used like the he-loves-me-he-loves-me-not daisy method of divining a suitor’s sincerity, or they could have been knotted into chains like dandelion-flower necklaces. 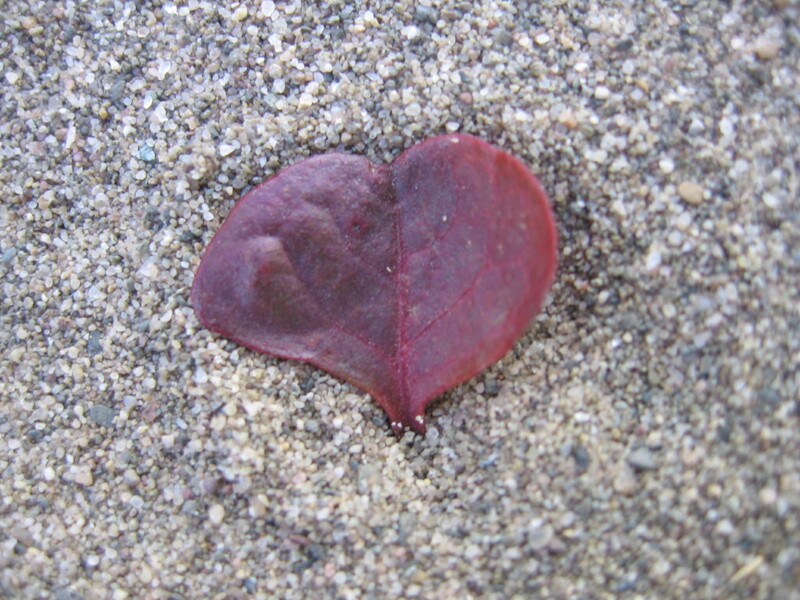 Several tribes used powdered seeds of Columbine to be sprinkled as a kind of love-dust. Other tribes marked a man’s palm with bloodroot, a native wildflower aptly named for the blood-red liquid which oozes from a cut root. As a more drastic measure—and maybe a last resort for the desperate and restless—yellow dock root was boiled and splashed on the face and clothes to make one more appealing to a love interest. Though, anyone who has seen yellow dock root knows it makes a yellow-staining dye, and therefore, it seems the amorous seeker would be made quite obvious. Contemporary use of aphrodisiac herbs include performance-enhancing herbs, such as yohimbe or Asian ginseng, which increase virility for men, or female tonics, which help maintain sexual function, such as an herb from India called shatavari, which means “she who has a hundred husbands.” The name conveys its efficacy. For relaxing into a romantic relationship, damiana (Turnera aphrodisiaca or Turnera diffusa) is a traditional herbal beverage, either as a tea or as a Mexican herbal liqueur. Supported by scientific studies, damiana is considered to be a mild antidepressant and nervine, which relaxes and calms the nerves so that a couple isn’t too stressed out to be interested in each other. Passionflower helps with marriage maintenance. For marriage maintenance, old-timey Appalachian herbalists revived tired domestic partnerships with passionflower vine, appropriate for couples who’ve grown bored in a relationship, having lost the appreciation for the familiar. 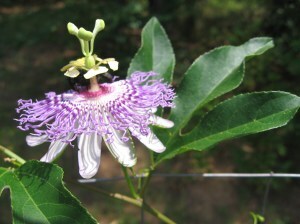 A recent clinical trial has proven passionflower as effective for anxiety as an anti-anxiety pharmaceutical benzodiazepine, which would likely help the relationship, as well. More than just finding and keeping a romance, love medicine can foster a sense of togetherness, which is needed in building and maintaining all relationships. Since communication is the key to maintaining healthy relationships, kava kava, a Polynesian herb which means “talk talk,” could be of value. Kava kava has been traditionally used to ease communication and facilitate a win-win conversation when different tribes join together in conversation. 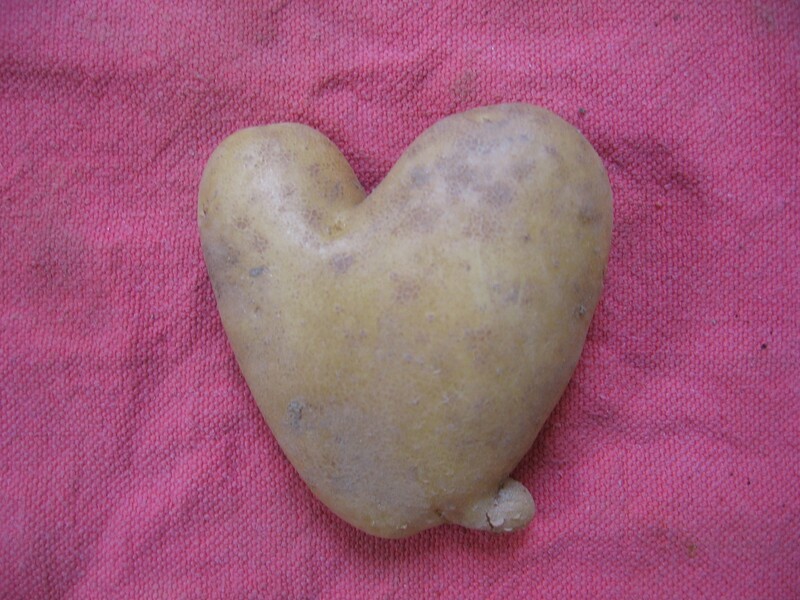 A farmer’s market potato heart. Most importantly, all love is built upon a compassionate, forgiving self-love. Cultivating self-love involves physically, spiritually and emotionally healing the wounds of the heart, so that one can be open to feeling love for others and allowing oneself to receive love. Reishi mushroom and hawthorn are used as herbal tonics to heal and support the heart on a physical, emotional and spiritual level. By nourishing the heart with antioxidants, and calming the emotional and spiritual mind which, according to Traditional Chinese medicine, resides in the heart, reishi and hawthorn prepare someone to learn to love and be loved in return. 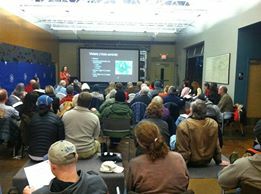 Tonight from 6-8pm I’ll be giving a free talk at Outdoor Chattanooga on freely available wild foods around Chattanooga. The snow prohibited my foraging, so I will have liquid extracts of the herbs to sample instead of food. 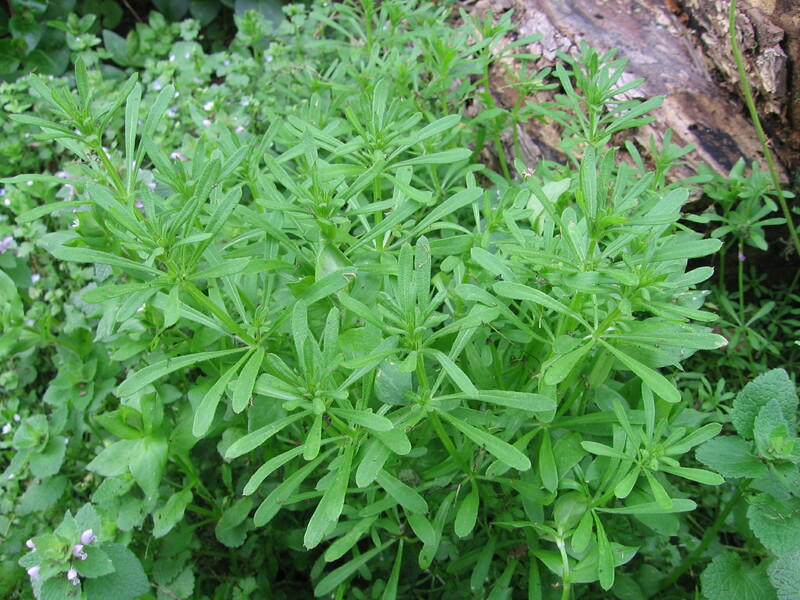 Cleavers are best juiced or lightly cooked. The flu is particularly nasty this year, and people have been getting it who even had a flu shot. We have a flu remedy at CIM pre-formulated and available for pick-up in our retail area. It’s best to have this on-hand so you don’t have to go outside when you’re sick. Elder flower and elder berry are antiviral herbs, and very helpful for the flu. The first ingredient is wild elder berry (Sambucus nigra), which is well-known for its antiviral properties. The elder tree is considered a medicine chest in itself. The leaf is used topically for injuries. Elder flower is useful for colds, fevers, flu. 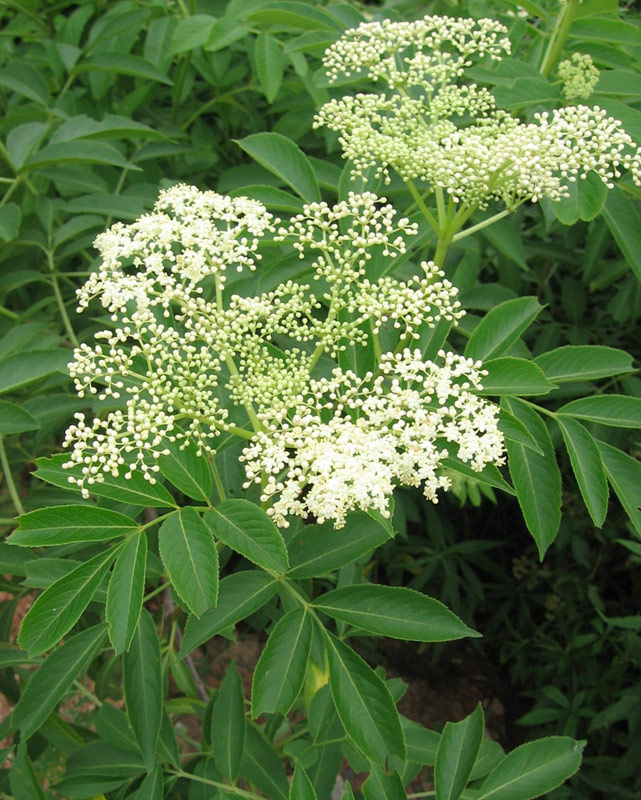 The berry of Elder has been shown to be effective against numerous strains of the influenza virus. It’s also been proven to reduce the duration of flu symptoms in a double-blind, placebo-controlled, randomized study. The next ingredient is boneset (Eupatorium perfoliatum), which gets its name from its reputation in alleviating the flu-symptom of achiness that feels like your bones are breaking, which to me is the worst part about having the flu. Boneset quickly deals with fever, reduces body aches, and clears up mucus congestion that might be present with the flu. Studies also show that boneset is an immunostimulant. 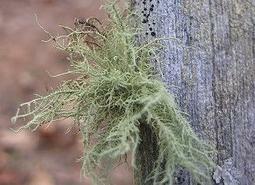 Usnea, or grandfather’s beard, is a lichen that gets blown from trees during wind storms. Usnea, a greyish-green lichen that grows on trees, is considered a respiratory phyto-biotic—that means it has some antibiotic properties. Although influenza is a virus, usnea might be helpful to prevent opportunistic upper-respiratory infections. Usnea is effective against gram-positive bacterial strains, such as Staphlycoccus aureus (staph), Streptococcus spp. (strep), Pneumonococcus spp. (pneumonia), Enterococcus spp., and Mycobacterium tuberculosis (tuberculosis). All flu formulas need to contain yarrow because of its fabulous diaphoretic properties. Yarrow (Achillea millefolium) is one of those plants I would want if I were stranded on a deserted island, so I won’t be able to list all of its uses, but just know that its uses are versatile. 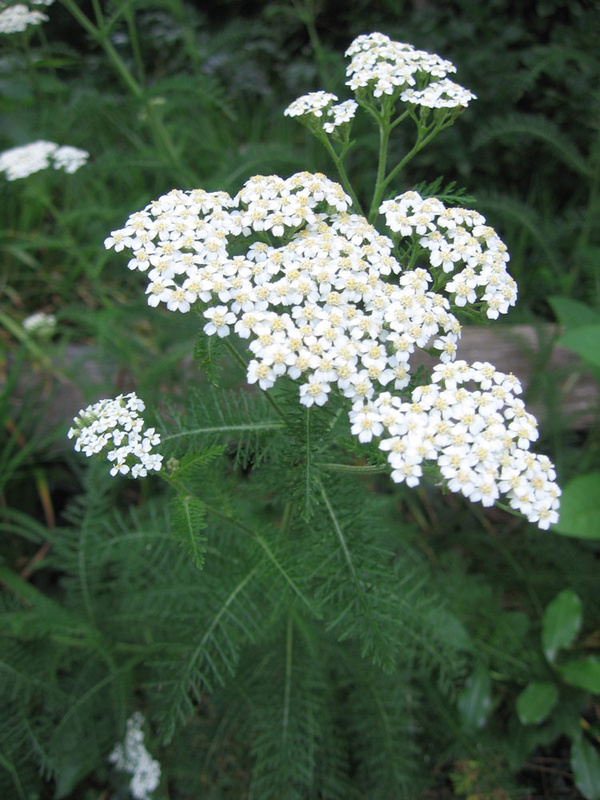 In the flu formula, yarrow helps in the acute stage of influenza to cause a sweat. Also, yarrow has antimicrobial properties to help battle with the germs. Yarrow, a standard in flu formulas, has a long history in many cultures as a herbal ally for human health. Finally, a little ginger goes a long way to add some warmth and flavor, but that’s not all. Ginger (Zingiber officinale) is also helpful for sore throats, nausea, and muscle aches. If you are looking for herbs to prevent the cold and flu, Astragalus can keep your immune boosted throughout the cold and flu season. Make an herbal appointment for a complete work-up and individualized herbal formula that can support your health through the season.